Kashipur is one of the tribal blocks of Rayagada district of Odisha where Tribal Sub Plan (TSP) project has been implemented by the Central Horticultural Experiment Station (ICAR-IIHR), Bhubaneswar. More than 450 farm families from 21 villages of 9 Gram Panchayat of Kashipur have been selected as beneficiaries under the project. The livelihood of tribal farmers was primarily dependant on agriculture and forest produce and they used to have subsistence agriculture. The area is characterized by undulated sloppy land wherein the cultivation of annual crops was challenging and unprofitable. Moreover frequent tillage aggravated soil erosion and in turn affected soil fertility and productivity. Considering the potential of fruit crops, mango was perceived as a crucial intervention to enhance income of poor tribal farmers. Consequently mango-based cultivation practices were initiated with the help of tribal society (HARPAL). The CHES took up mango cultivation in holistic manner and addressed the issues of production technology, post harvest management, skill upgradation and effective marketing of produce. Critical inputs and farm tools were made available and scientific production and post harvest management technologies were demonstrated to beneficiaries. The harvesting of mango was usually done by women and sold either in the local market (Kashipur) or at most in district headquarter i. e. Rayagada. They had no idea about mango maturity, harvesting technique, grading, HWT, packing and market channel. The lack of knowledge accounted for significant post harvest loss (25-30%) and in turn economic loss. 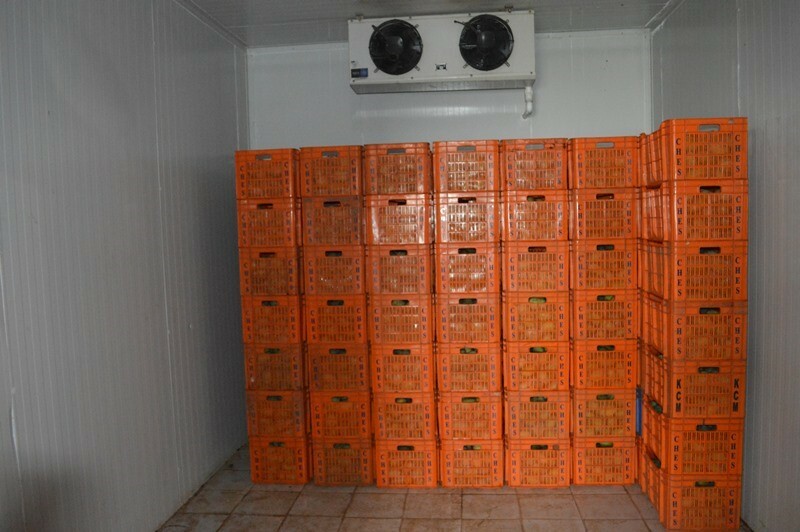 Considering the importance of market value of quality mango, techniques like judging of mango maturity, use of mango harvester and transportation of mango in plastic crates to maintain the fruit quality. Moreover grading on the basis of fruit size (grade I, II and III), use of low cost technology for production of ethylene gas (ethrel and caustic soda) to for fruit ripening, hot water treatment of mango (52 °C for 10 minutes) to manage anthracnose and fruit fly and fruit packing were important techniques for enhancing shelf life and value of the produce. The interventions showed the results as tribal mainly women farmers started harvesting fruits with peduncle at proper maturity and transported to collection point in plastic crates. With the help of HARPAL fruit were collected from different villages, graded by women and subject to hot water treatment and finally sent to Bhubaneswar by trucks. The Directorate of Horticulture, Govt. of Odisha also helped in providing ripening chamber to ripen the fruits with ethylene gas. Finally fruits were sorted and packed in the plastic crates and sent to Bhubaneswar Mandi. The interventions not only increased the fruit quality and income but also the marketable surplus by reducing the post-harvest loss (< 10%). The beneficiaries, who were selling fruits at the rate of Rs. 10-12/kg in local market, started selling of quality fruit at Rs. 20-25/kg. The marketing channel for mango enabled them to supply every day about 50- 60 q of mango in Bhubaneswar Mandi. The adoption of interventions and linkages with the local society and State Horticulture Deptt., Govt. of Odisha, transformed the mango cultivation into a profitable venture and brought smile on the faces of resource-deficient tribal farmers of Kashipur, Rayagada, Odisha.